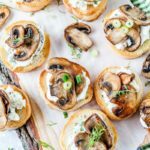 Mushroom Crostini is delicious and elegant appetizer that is really easy to make and is perfect for any time of the year. 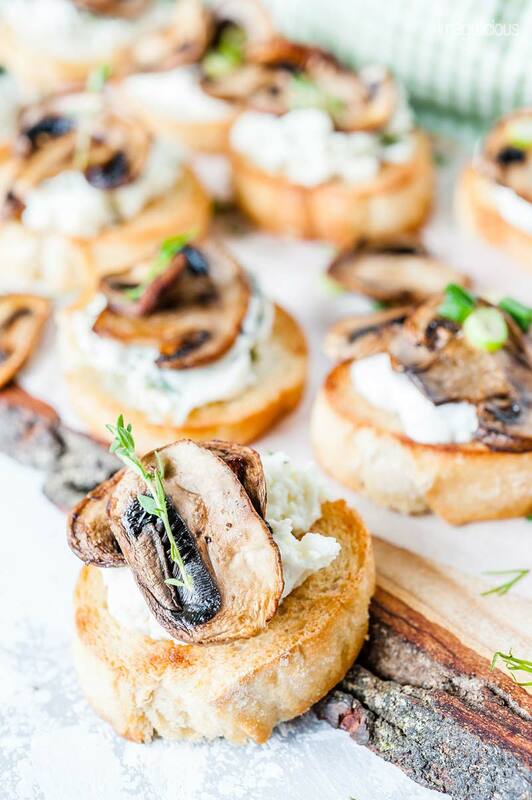 Made with ricotta, sour cream, or cream cheese, and, of course, perfectly sautéed mushrooms, they will satisfy any taste. 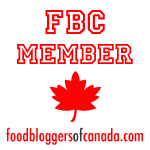 A few months ago I wrote about my newfound love for mushrooms. 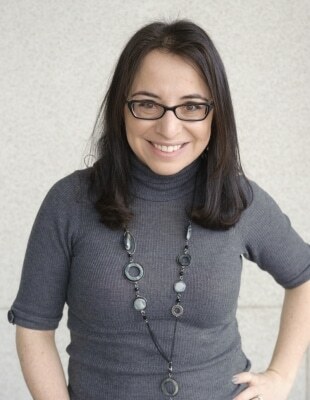 I discovered an amazing way of how to cook perfect mushrooms every time and I haven’t stopped cooking them since. When we have people over I usually opt for a very easy and hands-off entree. In the cooler months it’s some kind of roast, in the summer it’s steak or burgers on the BBQ. And these perfect mushrooms are a perfect accompaniment to the meal. However, I’ve been meaning to make something else with the mushrooms for a while now. I wanted to preserve my favourite way of cooking them but add some kind of twist to the recipe. I love crostini so my mind immediately went to my tried and true flavour combination of ricotta and thyme. But then I thought of the classic and very traditional Russian combination of sour cream and mushrooms. And then my mind wondered even more and I thought that mushrooms with cream cheese would be perfect. 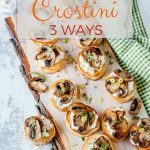 So, I came up with Mushroom Crostini 3 Ways. All three delicious, all three easy, all three flavourful and very affordable. 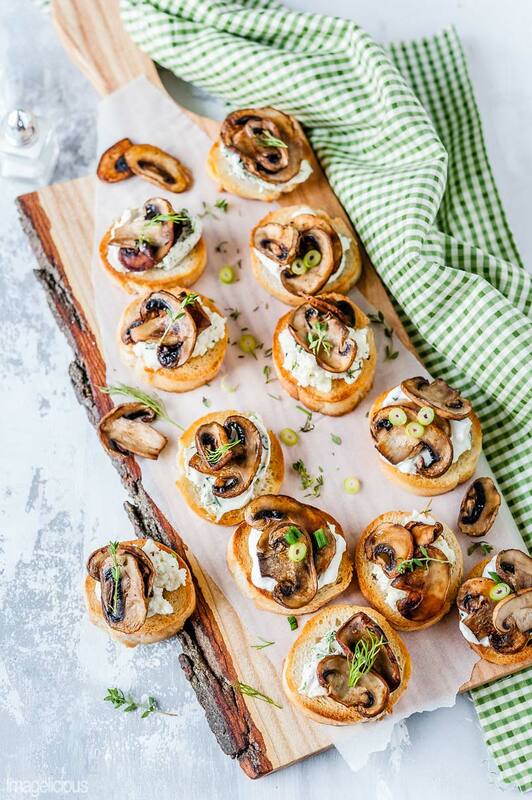 Not only these Mushroom Crostini are easy to make, they are also perfect to make for a dinner party as individual components could be made in advance and they only take a few minutes to assemble before guests come over. Mix sour cream, ricotta, and cream cheese with herbs and refrigerate; you could do it early in the day or even a day or two ahead. Toast the baguette slices in the morning and cook the mushrooms at the same time. A little bit before the guests come over get all the delicious dairy spreads and mushrooms out of the fridge to bring them to room temperature and then assemble. 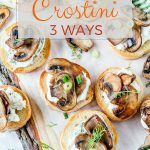 Being Russian my favourite is sour cream and green onion Mushroom Crostini but I really like all three. They look gorgeous on a table and taste amazing. The recipe can easily be doubled or tripled if needed. 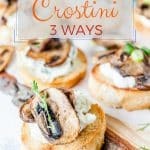 Can you store Mushroom Crostini? You can’t really store assembled Mushroom Crostini as the baguette would get soggy after a while. However, you can store individual components easily. Toasted baguette could be stored at room temperature for a day or two if you live in dry climate. Humid summer days may not work though. Ricotta, sour cream, and cream cheese fillings can be stored in an airtight container in the fridge for about 3 days. And cooked mushrooms can also be stored for a couple of days in the fridge. And, of course, How to cook perfect mushrooms – you won’t believe the secret!!! 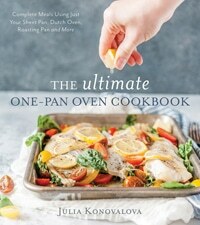 Heat medium size pan on medium heat and melt half a tablespoon of butter. Add sliced mushrooms, stir and cook for about 8-10 minutes WITHOUT STIRRING. Not stirring allows the mushrooms to lose liquid, then it evaporates and later the mushrooms get golden brown. After about 8-10 minutes stir the mushrooms and flip them to the other side, add the rest of the butter and cook again WITHOUT STIRRING for a couple more minutes or until there's no more liquid and they are all golden brown. Meanwhile in a different large pan heat 1-2 teaspoons of olive oil and toast the baguette slices until golden brown on both sides. For me it usually takes exactly the same amount of time as the mushrooms take to cook. While both mushrooms and baguettes are cooking, make different spreads. Mix softened cream cheese with chopped dill, add salt and pepper to taste. 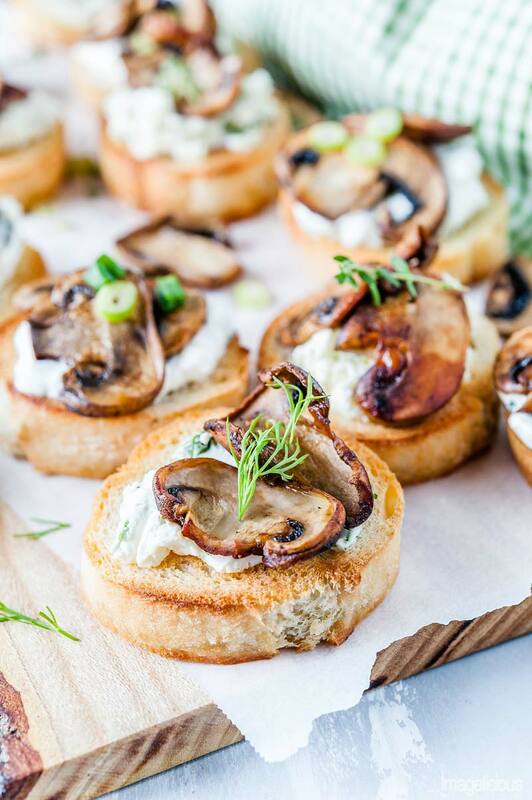 Leave a little bit of chopped dill to sprinkle on top of the mushroom crostini. Mix ricotta with 1 teaspoon of olive oil (if using), leaves from 3 sprigs of thyme, add salt and pepper to taste. 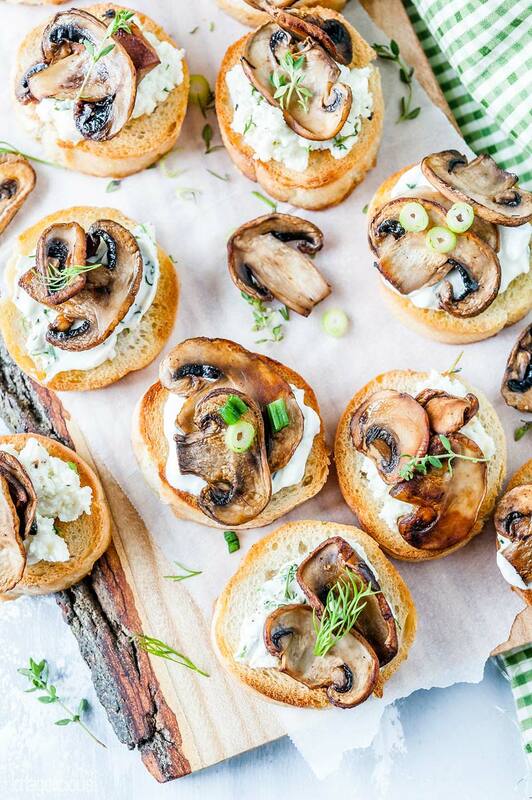 Leave a little bit of thyme to sprinkle on top of the mushroom crostini. Mix full fat sour cream with chopped green onion, add salt and pepper to taste. 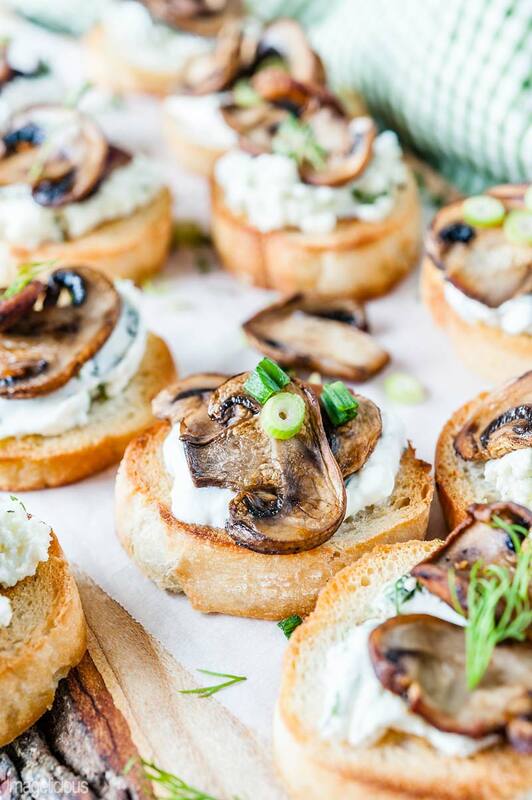 Leave a little bit of chopped green onion to sprinkle on top of the mushroom crostini. Top toasted baguette slices with different spreads, 4 baguette pieces with each of the sour cream, cream cheese, and ricotta spreads. Top with sautéed mushrooms and sprinkle with leftover herbs. You might have a little bit of each spread left over. Feel free to make a couple more crostini with it.